to save an extra power adapter. 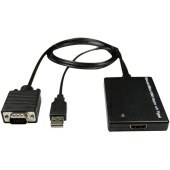 Conversion: It can convert PC’s VGA video and USB 2CH audio into complete HDMI. Support common VGA video resolution. Support 165MHz/1.65Gbps per channel (6.75Gbps all channel) bandwidth.